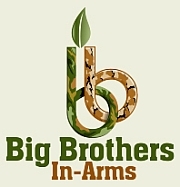 » Vietnam Vet “Axel,” Memorial Ride Warriors' Watch Riders: WE HAVE YOUR BACKS AT HOME! It was a dreary, wet morning, but in an effort of optimism, I chose chaps rather than rain gear. At 7:30 am, 5 riders departed a Malvern Wawa into a steady drizzle. I cannot possibly express my gratitude to Handyman, Fungi, RedBeard, and Deuce for joining me on this journey on such a wet day. Around Lancaster, the weather seemed to be clearing, and the roads were getting drier, and for a moment, it seemed the sun would come out. And then we got near York, and the real rain began, but we were close to a planned stop along the route. As I slowed to make the right turn into the service station, I checked my mirror to make sure I wouldn’t be crossing in front of Fungi…and watched him go down. My heart sank into the pit of my stomach. He had just crossed the railroad tracks and his rear tire got loose on the wet steel plates as he slowed to make the turn. Thankfully, he and the bike appeared to have received only minor scrapes, and he was able to mount up and keep rolling. We proceeded to the stop and took a moment to let nerves settle, and hopefully let the rain blow over a little. When it appeared the rain had let up, we mounted up and headed down Interstate 83 for a 10 mile stretch. The skies once again opened up, and the traffic added to the blinding effect of the water hitting us until we made our exit onto the back roads. Once again, conditions gradually improved, and the closer we got to the main rally point, the bluer the skies were getting. We arrived at the rally point in Westminster at approximately 10:30, where we met up with the Maryland crew: 4 bikes and 1 pickup. Thank you so much to Sgt.Grumpy (dball21921) and Bob (marinecorps72to76) for pulling together so many to help in this mission. It was an honor to meet the Gambills, Jay, Ron, Sam, Andy and everyone else whose names I apologize for losing track of. I cannot begin to express my gratitude to you all for weathering the elements to support this mission. I am personally truly grateful. After a ride briefing, we mounted up and headed up to the house. A few of the Maryland guys hung back, after deciding to go purchase extra flags to make up for the ones that didn’t arrive due to a last minute cancelation. We arrived at the house before most of Axel’s friends and family. With minimal direction needed, we set up a flagline at the end of the driveway as the cars and bikes arrived for the service. When it came time, we moved the flag line from the driveway to encircle the area in the back yard during the service. This was done quietly, and transparently. I opted not to disrupt the tone by making any formal calls to action of the honor guard, because it wasn’t necessary. They were already doing exactly what they were supposed to be doing. And the weather even cooperated for the duration of the service. As RC I couldn’t be prouder of my fellow Warriors’ Watch Riders. You did right for one of this countries many fallen veterans. As Axel’s friend, I couldn’t be more thankful. I’ve stood flaglines at funerals, I’ve seen what it means to the friends and family…and yesterday, I saw it again. Karen, Axel’s ex-wife, was beside herself. Axel’s family expressed their appreciation to me as well. But this was the first time I was also on the other side of the flagline. To see that, I can’t tell you what it meant to me. I know may of you were there because this was MY mission, and I cannot possibly thank you enough. After the service, we mounted up for the ride to Gettysburg. Axel led the ride. I had his ashes, in his helmet, strapped to the handlebars of my bike. The second bike in the procession was Blackie, (the bar hopper), technically an Indian…but a bike built by Axel himself, now owned jointly by two of my friends. 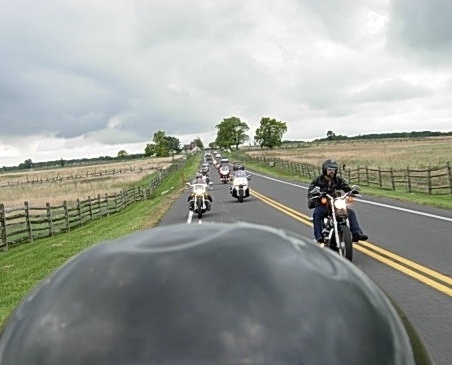 We had 16 bikes for the ride to Gettysburg…half WWR, the other half, friends of Axel from MD, VA, TN, TX, DE, and PA. The ride went as I have come to expect with my friends…Axel’s bike didn’t want to start, one girl dropped her bike as we were getting ready to roll out, another guy ran out of gas just before we got to our first stop…all minor glitches that were corrected quickly. We arrived at the spot I had chosen, and once again WWR set up a flagline while I said a few words on behalf of Axel and spread a small amount of his ashes. We took some pictures, and prepared to head out. The rain was starting to roll in again. I had left my soaking wet chaps back at the house, so this time I decided rain gear was a good idea. When the majority were ready to roll, I looped back to check on the MD contingent, and was told they were going to head out form that point on their own…and it was my understanding the rest of the WWR guys were going to do the same. So I led my friends back to Westminster, where a few more late arrivals were waiting. One of my best friends from NJ had gotten held up with traffic and weather, and had missed the service and the ride, but he had to return home that night. So, at 7 pm I decided to ride home with him by my side rather than wait until today and ride through the rain by myself. I am glad I did. We hit a light rain within the first 10 miles, but the weather held off for the next 90. Of course, I was 50 miles away when I remembered my saturated chaps were still hanging in the garage in Westminster. I am glad that everyone made it home safely. Again…thank you thank you, to everyone that was there. I am truly honored to be a part of this group, because of people like you. Duece…I hope you were able to catch up with your daughter, and that she has a speedy recovery from surgery. Thank you for making this ride. Red…Thank you for capturing some great shots. Handyman and Fungi…I am truly grateful to you guys for being there for me. And once again, everyone from MD…you all went above and beyond. Thank you so very much. I am looking forward to seeing you all again on future missions. No user commented in " Vietnam Vet “Axel,” Memorial Ride "